We were referred to University of Iowa Stead Family Children’s Hospital after our son, Cole, had an unexplained fever for 14 days. When we arrived at the hospital, we were initially admitted under the care of infectious disease because they were still wondering if the fever was caused by something viral. Within 12 hours of being admitted, we were given the diagnosis of pre-B cell acute lymphoblastic leukemia. From that moment, we were on a road map that would lead us through over three years of treatment. 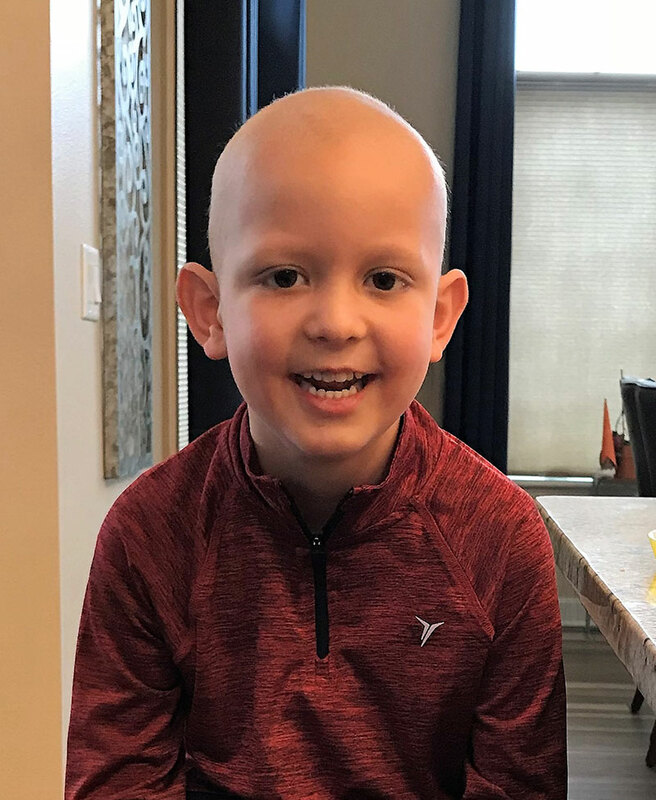 Within four days of diagnosis, Cole had a port placed and received his first dose of chemo. The fever finally broke after 20 days. Cole has received the best possible care that we could hope for at UI Stead Family Children's Hospital. The team that we see at every visit makes him feel like he can have fun and still be a kid despite having leukemia. Everyone is very helpful and informative with his care, what to expect, and how they respond to any situation. His pediatric oncology team includes Arunkumar Modi, MBBS, MPH; Steve Rumelhart, PA-C; Mariko Sato, MD, PhD; and all of the wonderful nursing staff. They know me by name when my number pops up on the phone, and they make it a point to get Cole little trinkets to brighten his day. Child Life and the Music Therapy team help keep spirits up when we've had to go inpatient. The Dance Marathon volunteers have been awesome at coming in to play games and spend time with Cole. As I mentioned, the children’s hospital has a road map that they follow for his care. It helps us all to know what is coming up, what to expect, or what may be different than previous times. We have been receiving care for just over eight months. This has included multiple transfusions, blood draws, emergency room (ER) visits, 18 missed days of school, a myriad of chemotherapies, physical therapy (PT) and occupational therapy (OT) appointments, and, thankfully, more good days than bad. And I think the level of care he receives has a lot to do with that. It is a wonderful place and I truly feel the care is top notch. You can tell they care about their patients and know each of them by name.